In the Tinker Garage LEGO Robotics & Scratch camp, kids spend all their time programming LEGO Wedo robots using Scratch. LEGO WeDo is a popular educational robotics kit for kids. In this course, students will learn about robotics, build LEGO robots, and most importantly learn how to write Scratch programs to control the robots. Their Scratch programs will interact with the real world using the LEGO WeDo motor, motion sensor, and tilt sensor. 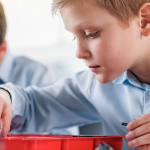 Kids will also learn how to use the LEGO sensors to provide feedback to their Scratch programs, enabling things like interactive game controllers, motion alarms, and Scratch games that intersect with the real world. Create your own interactive LEGO WeDo and Scratch game, story, or app. Learn how to use Scratch to program external hardware devices (LEGO WeDo).